On August 5, 1993, mathematics Professor Richard Garfield released a set of 240 playing cards that would change the gaming landscape forever. But the story of Magic: The Gathering (“MTG” for short), starts much earlier. Garfield had been creating games since at least as early as 1982, when he came up with a card game called Five Magics. While Five Magics went on to inspire Garfield’s friends to develop additional magic-based card games, within a few years, Garfield had moved on. In 1991, Garfield was working toward a Ph.D in one of my favorite areas of mathematics, combinatorics. By that time, Garfield had also teamed up with Mike Davis to create the popular board game RoboRally. Davis eventually pitched the game to Peter Adkison and James Hays of American game publisher Wizards of the Coast (“WotC”). Adkison and Hays loved RoboRally, but explained to Garfield and Davis that WotC was not in a position to release a board game at that time. Disappointed, Garfield responded, asking Hays what WotC was in a position to publish. Hays told Garfield that WotC was looking for a portable card game that people could take out and play during downtimes at conventions. The rest is history. Returning home, Garfield dusted off Five Magics, began adding to the good things, and chiseling away at the bad. Garfield focused on combining the collectability of baseball cards and the chaotic asymmetrical energy of the iconic board game Cosmic Encounter with the beloved fantasy elements of Dungeons & Dragons. After multiple failed attempts, Garfield eventually landed on a game he simply called “Magic.” To deter people from buying hundreds of cards and only using the most powerful cards in his game, Garfield included an “ante” mechanism. The ante worked much like a claiming race in auto sports or horse racing. At the beginning of the game, both players would randomly select one card from their decks and place them aside. The winner of the game would then own the two ante cards. The ante system placed a financial disincentive on using only rare and expensive cards to compete against a deck of more common cards. 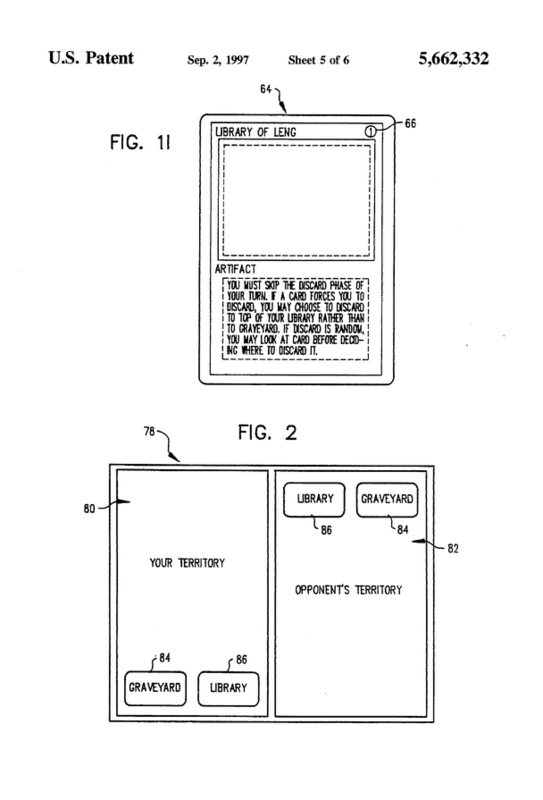 As shown below, the now-expired MTG patent originally covered a game mechanic whereby players would make some type of designation that certain cards were being brought into play. The “tapping” mechanic could involve simply rotating the cards sideways. 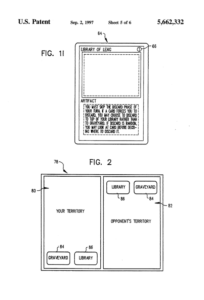 (ii) designating the one or more game components being brought into play by rotating the one or more game components from an original orientation to a second orientation.